Chinese President Xi Jinping is leaving Mauritius on July 28, the last stop of his visit to the Middle East and Africa. During his 11-day trip, Xi paid state visits to the United Arab Emirates (UAE), Senegal, Rwanda, South Africa and a friendly visit to Mauritius during a stopover. He also attended the 10th BRICS Summit in Johannesburg. The visit opens new prospect for the South-South cooperation and promotes the building of a community with a shared future for mankind, said Chinese State Councilor and Foreign Minister Wang Yi. Xi's visit to the UAE brings bilateral ties to a higher level and gives a demonstration for cooperation between China and Arab countries, Wang said. It is Xi's first visit to the UAE, and the first by a Chinese head of state in 29 years to the Arab state. During the visit, the two countries issued a joint statement on establishing a comprehensive strategic partnership, which provides political guidance and overall plans for the development of bilateral relations in the next stage. They signed a memorandum of understanding on implementing the Belt and Road Initiative, and decided to dovetail their development strategies and strengthen communication on industrial policies. China and the UAE will accelerate the establishment of the first Belt and Road international exchange in Abu Dhabi, which will provide financial services to the construction of Belt and Road in the Middle East and the Gulf region. Earlier this month, Beijing hosted the eighth ministerial conference of the China-Arab States Cooperation Forum at which China and Arab countries agreed to establish a "future-oriented strategic partnership of comprehensive cooperation and common development." Xi told the conference that China is willing to join hands with Arab states to build the Belt and Road, and to build a community with a shared future for China and Arab countries. Xi's UAE visit is a lively interpretation and a successful roadshow of China's policy toward Arab states, Wang said. Xi has attached great importance to China-Africa relations. He chose Africa as the destination of his first foreign visit both after he was first elected Chinese president in 2013 and after his re-election this year. China and Africa are sincere partners on their path of development and natural allies in international affairs, Wang said. During his African tour, Xi emphasized that it is China's long-term and firm strategic choice to develop ties with African countries. No matter how the international situation changes, China will continue to uphold its African policy and concept of sincerity, concrete results, affinity and good faith, uphold justice and pursue shared interests, promote the construction of a closer China-Africa community with a shared future, so as to realize win-win cooperation and common development, Xi said. During the visit, China and the four African nations have agreed to strengthen the alignment of their development strategies, further tap their economic complementarities and expand the scope of cooperation. Another key achievement of Xi's African tour is the signing of cooperation documents regarding the Belt and Road Initiative. Senegal and Rwanda respectively signed memorandums of understanding with China on the initiative and Mauritius reached agreement with China to sign the cooperation accord on the initiative at an early date. Senegal is the first West African country to sign a Belt and Road cooperation document with China, and it is expected to have a driving effect in the region, said Wang. During his visit, Xi and his African hosts have seen the signing of some 40 cooperation documents, he added. At every stop of his African tour, Xi was given grand welcome ceremonies by the governments and was received with exceptional hospitality by the local people, which is a valid proof that China's role in Africa is by no means neo-colonialism, according to the Chinese foreign minister. During his visit to South Africa, Xi attended the 10th BRICS Summit in Johannesburg, which opened up the second "Golden Decade" for BRICS cooperation. The summit of the bloc of emerging market economies from July 25-27 gathered leaders from its members -- Brazil, Russia, India, China and South Africa -- to discuss ways in seeking common development and prosperity amid new global challenges. While addressing the BRICS Business Forum at the summit, Xi said that the next decade will be a crucial one in which new global growth drivers will take the place of old ones, seeing faster changes in the international landscape and the international alignment of forces, and witnessing a profound reshaping of the global governance system. Xi also called for building an open economy, rejecting unilateralism and protectionism, boosting international exchanges and cooperation in innovation, easing the impact of application of information technology, automation and smart technology on traditional industries, as well as pursuing inclusive growth to deliver benefits to people of all countries and promoting international development and cooperation. He also urged to uphold multilateralism, support multilateral trade regime and fully observe collectively adopted international rules. "A trade war should be rejected, because there will be no winner. Economic hegemony is even more objectionable, as it will undermine the collective interests of the international community; those who pursue this course will only end up hurting themselves," Xi said, in response to the rising unilateralism and trade protectionism. The Johannesburg summit has yielded fruitful outcomes, with the BRICS countries confirming to forge a partnership on the new industrial revolution. The establishment of such a partnership will become a flagship project that will push forward cooperation among the BRICS countries, Wang said. Meanwhile, he said, the Johannesburg Declaration voiced the bloc's determination to pursue common development, preserve equity and justice, stick to multilateralism and improve global governance, injecting positive energy to the world amid great uncertainties. 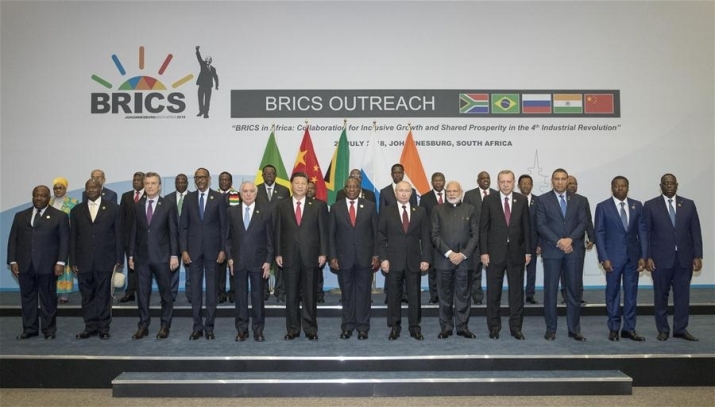 The BRICS Summit also invited other developing countries including other emerging market economies and African nations to participate in the "BRICS Plus" dialogue, further expanding the BRICS circles and strengthening the partnership between the BRICS and African countries, Wang added. It is a historic visit during which China has strengthened strategic cooperation with developing countries and emerging economies, and which will have significant and positive impact on the transformation of international landscape and the progress of mankind, Wang said.